“I am not only interested in seeing, but also in hearing the body.” Reflective conversation with Slovene dance maker Nataša Živković on the impact of the two-year Performing Gender – Dance makes Differences project on her artistic practice. Nataša Živković is a dance maker, actress, choreographer and mentor from Ljubljana, Slovenia, with a rich history of artistic collaborations and solo performances. Her debut First Love’s Second Chance (City of Women, 2009), and her dance and theatre achievements brought her the Golden Bird Award in 2009. Her most recent solo work, Sonny (City of Women, 2018) explores the history of women, male supremacy and strategies of female empowerment in the Balkans. In this interview, conducted by Tea Hvala and Teja Reba, Nataša Živković reflects on the “training weeks” programme she received in the first phase of the project, and on the one-week workshop for ten young dancers she led in the second phase at Yorkshire Dance in Leeds, UK, together with dance dramaturge Tanya Steinhauser. She also discusses the impact of the Performing Gender project on her solo work. Can you reflect on how the “training weeks” have enabled you to develop your artistic practice? In particular, how the training has and continues to impact on your movement research or physical exploration of the project topics? Have you discovered, developed and used any new tools or methodologies? During the “training weeks”, I have met a number of artists who inspired me by sharing their own work methods and their thoughts on dance and the creative process. In Ljubljana I met with the Irish choreographer Oona Doherty - I have taken with me her specific approach on how to physicalize a certain character – or better – how a certain human character can emerge from a concrete physical experience of the body or a specific movement quality that deals with levels of muscle tension, fluidity, etc. Also very interesting was Oona’s way of connecting vocalisation (letters that become words that become meaning) with movement. I was also inspired by the Spanish visual artist Eva Viera, with whom I have met in Madrid. She suggested that we enter a shared conversation with a visual stimulant (a photograph, a visual artwork), and start by talking about what that image triggers in us in a very personal way, rather than starting with a conceptual questioning of gender and somebody leading the conversation. During the workshop I later gave to ten young dancers in Leeds, I used similar tasks. To discuss gender-related themes, I proposed visual images as entry points. From this discussion, we picked recurring words, for example “disguise”, “privilege”, “female fiction”, “isolation”, “radical”, and created proposals where we would use a certain word and either vocalise it in relation to the movement (decompose it, fragment it, play with it) or simply use it as an inspiration. It is also important for me to ask why we move our bodies, what is the vehicle behind a certain kind of energy; it’s not only about the movement for the pleasure of moving. Sometimes, I feel that dancers are somewhat cut from delivering speech because of the fact that our main tool is the physicality of the body. Personally, I am not only interested in seeing, but also in hearing the body. I am interested in how to better connect the rational of the mind and the supposedly irrational of the body. For me, these two aspects are intertwined. The action of giving back voice to the body is therefore an “un-muting” action also in a political sense. Finding a specific word, like a metaphor, is something that I was reminded of by the English dance maker, writer, curator and teacher Amy Bell during my “training week” in Leeds. A metaphor for what we are doing and researching can pin down and – at the same time - open up new possibilities of imagining and understanding it. When I was researching the phenomenon of “sworn virgins” from the Balkan area, I came across an interview in which one of them says: “Wearing a man’s suit is a privilege.” For example, “a man’s suit” is a metaphor I found helpful in my research process. It can mean different things and bring different associations: my father, something that doesn’t fit, weddings, funerals and other social rituals, cross-dressing, etc. Coming back to Amy Bell’s workshop: her understanding of what we needed at that moment was remarkable. I imagine this was possible because she had been involved in a similar project and felt what we were going through, so she could offer us some clear tools that we could use later on when we facilitate on our turn a group workshop. Most important questions were: how do you invite the workshop participants into your process? How do you shape your invitation in order to research a specific question/task? How do you make your interest available to the participants in order to allow them to be creative within that frame? To what extent do you want to guide them and what is the entry point to a certain task: is it based on words, movement, choreographic material, music, objects or images? Since one of the aims of the Performing Gender – Dance makes Differences project was that we (the five selected dance makers), after the training weeks, transmit the experience and knowledge to younger dancers, I appreciated Amy’s contribution a lot; she gave us some really concrete tools to operate with. 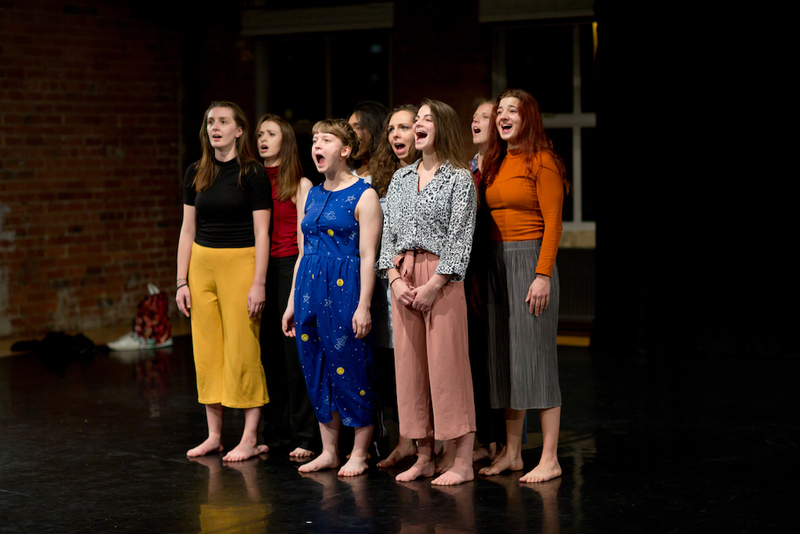 One of the really important things for me was how we connected and functioned well as a group, even though this type of cohesion was not a deliberate aim of the Performing Gender project, since the emphasis was on individual artistic development. I learned from all of them: Koldo Arostegui Gonzáles brought the humour and playfulness, Roberta Racis brought the physicality. I am extremely happy to have met Sophie Unwin and Jija Sohn. I strongly connected with them both in an artistic and in a personal sense. With Sophie, I share certain conceptual approaches and reconsiderations of womanhood. And with Jija I met somewhere beyond language and meaning. Also, I had great exchange with dramaturges, especially with Nina Aalders and Tanya Steinhauser, with whom I had a really pleasurable connection during my/our workshop in Leeds. We often addressed the question of the role of the dramaturge. Since it can mean so many things on different levels, the dramaturge’s role is always a bit unclear. Is she supposed to be always present during the creative process, or not too much in order to have a clearer sight? For me, the dramaturge is firstly somebody who I feel I can talk to. Somebody who supports me, but at the same time is able to rethink and challenge me because I need to be challenged by another perspective, I do not need the confirmation of my own world (thoughts, ideas, ways of doing things). And Tanya Steinhauser was able to do all of that. I am happy it was a mutually respectful and fruitful collaboration. Also, when you cross borders, you encounter different cultures. Tanya is a person with a German background living in the UK, so we could share some thoughts on the cultural differences concerning the understanding of gender(s) too. I also deeply respect and admire English live artist, dance performer, choreographer and dance film-maker Liz Aggis whom we had the honour to meet in Den Bosch. Watching her performing, I was in-between laughter and tears, stunned by such generosity on stage. To be an older female performer still kicking and being there hundred percent – well, it is a big motivation! For me, art is not just about art; it has to do extremely a lot with the people who do it, participate in it, watch it. That is why I am talking so much about the people who surrounded me in this project. When you respect and connect to the people in such a network, it becomes a human experience we can all benefit from. Can you reflect on any moments that were pivotal to you as dance maker? Can you reflect on moments when you felt most uncomfortable or challenged? Did any of them lead to new learning, insight or artistic practice? And if so, how? At the MIT (Transsexual Identity Movement), in Bologna, after listening to our introduction a young transsexual person said: ”But why are you doing it? Why it is not us, we have the actual experience, we have to live with it.” This intervention left us puzzled and we dwelled on that question a lot. It addresses privilege and appropriation and it asks of me to be precise about what my place of interest is and from where I speak. Sometimes during the project, I had the feeling that our reflection on gender issues is superficial in the sense that it is currently trendy to talk about the fluidity of gender (“you can be whatever you want to be” in the neoliberal sense of choosing identities). But it is not the same thing to have the freedom and the right to choose another gender, or to feel uncomfortable about the biological gender you were born with/ to, or even to reject the concept of gender as such. So, I can say that it was a good thing to be challenged by someone who lives this experience. I had to ask myself again how do I respond to this as an artist, how can I find ways to speak about this – not necessarily in terms of appropriation but rather from the viewpoint of interest, empathy and artistic processing. There was another moment connected with this sense of not being articulated enough: it happened during the discussion after the sharing of our research sketches in Den Bosch. The conversation wasn’t really successful, we faced a demanding audience which wanted clearer answers from us. The next day, I discussed this a lot with Teja Reba, artistic director of City of Women, Ljubljana’s partner of the Performing Gender Project. It seemed to us that we somewhat neglected this crucial moment: the need to articulate more precisely what we are researching. The project didn’t demand this from us enough. To speak about your work, even if it’s still in process, is not an obvious skill, it needs to be practiced too. The only moment when a clear articulation of the research was asked from us was before we started our training week in Leeds in May 2018. After a very long break, starting in December 2017, we were asked to write down what we were working on, what was our interest at that point. This was very useful for me since I had to focus on a particular interest and pin down my theme. I chose to research the phenomenon of the sworn virgins of Montenegro, Albania, Kosovo and Metohia. I used this research both for the workshop I later gave to young dancers in Leeds, and for my solo Sonny, premiered at City of Women Festival in October 2018. 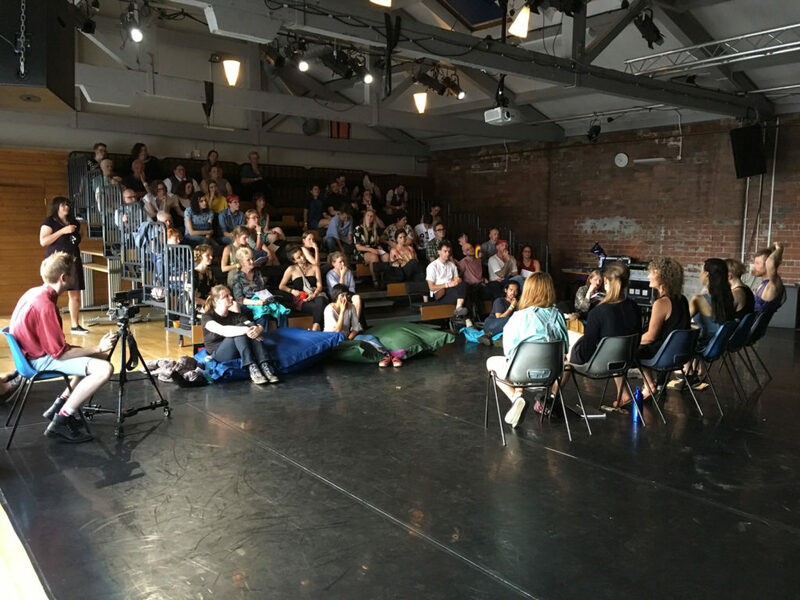 At “the training week” in Leeds I first encountered the “critical response” format/technique of post-show audience discussion. I found it interesting because it asks the audience about their thoughts, associations or images and doesn’t necessarily go straight into questions or critique. As such, it takes care of the dance maker’s integrity, which is important in a situation where you present an unfinished work. In this sense, it felt safe in the post-sharing discussion whereas in Den Bosch it didn’t. What do you think has shifted for you in these two years when it comes to learning about gender: can you summarise any themes, insights, connections or threads that have emerged throughout the weeks for you? Is this influencing the kind of research questions you are developing now? Having been surrounded with people who think about, are sensitive to or experience daily in their life different aspects of gender-related issues, has been very valuable to me; it made me more sensitive and aware of those issues, whether they concern the lives of transgender people and people who define themselves as non-binary or women’s rights and feminism; how gender is related to history, class, capitalism and socio-geographical map. I liked the fact that Yorkshire Dance in Leeds connects the dance community and the trans/non-binary community more than any other venue I’ve visited within the project. In my life in Ljubljana, I didn’t take so many opportunities to meet or speak with transgender or non-binary people, the community in my city is quite small and is just starting to come out somehow. Now, I feel more encouraged to meet and talk with different communities. Also, when I was recently touring my solo performance Sonny across Slovenia, some transgender and non-binary people came to the show, and their feedback was very valuable to me. My activism stems from a feminist position, so I am busy with understanding how to connect these multiple positions to feminism. How to think about trans_gender and non-binary positions from a feminist perspective, how gendering happens through language, how different genders are perceived in specific cultural, geographical and historical context? And: how is gender intrinsically linked with power as well as class and race privilege. To me, one of the most important conclusions during the project was that it is not something that should be enclosed within the identity politics discourse. Instead, discourses about gender are traversed by all of the above-mentioned elements. The project focuses on artistic practice as activist practice. Can you reflect on how you might have developed your practice, thinking or approach in relation to activism? I think I can talk about activism on stage when I feel that what happened had a real impact on me and the viewers; something is going to stay with them and make them reconsider their own position. Generally speaking, though, I would rather prefer the term “political” to “activist”. For me, the “political” carries more meaning, following the sense of “the personal is political”. The politics or the bio-politics of our daily lives needs to be addressed again and again if we want to influence and promote changes, also at the level of state politics (for example, promoting laws that benefit trans_gender, homosexuals, non-binary people). I am certain that all these experiences already are – and are going to continue to – influence my artistic research. As mentioned, I made a solo work entitled Sonny in October 2018. The performance speaks about the privileges of being a man, and questions the nature of women’s power, freedom and choice to become masculine in the Balkans by taking on a man’s role. I use the stories of the “sworn virgins” of Montenegro and Albania as an entry point to rethink the history of women, male supremacy and strategies of female empowerment in the Balkans, to further ask where are we today? Does a woman still have to lower her voice to be heard? Does she have to wear trousers if surrounded by men in suits? How do we perceive authority and power? The performance is produced by City of Women and was stimulated by the Performing Gender research process. Are there any other, perhaps unexpected or surprising insights or learning you’ve embraced in these two years as a result of this project? On my journey during the Performing Gender project, I really liked having the opportunity to experience different discussion formats. Among the most interesting ones was the Fishbowl technique, introduced to us by Job Rietvelt in Den Bosch. The discussion is based on a couple of questions that the whole group formulates together in advance. Everyone sits in a circle, and there are four chairs in the middle. Whenever you want to talk, you need to physically jump into the conversation - to sit on one of these chairs in the middle, which means that the person who spoke earlier has to leave the chair to make space for you. This allows very dynamic conversations, and at the same time, if you don’t feel like talking, it gives you the opportunity to just participate while listening. I used the Fishbowl technique in my workshop with young dancers in Leeds. As I’ve learned from the feedback, they really liked having the opportunity to talk in this kind of setting. I am developing moderated audience discussions after my performance Sonny, and I find it amazing how people are open to speak about gender issues. For me, it feels almost like another performance, or let’s say that these discussions have a performative element to them, which I really enjoy. I see these discussions as a different way of opening an artistic work to the audience, and taking further the themes it deals with. In relation to dramaturges, I appreciated a lot how some of them presented themselves with a lecture, based on their specific domain. In Ljubljana, Tea Hvala gave a lecture on the history of feminism(s) while in Madrid Sergio Martínez Vila showed us some examples of visual art and cinema, which he thought were relevant to the theme of gender. I thought this was a very good way of getting to know the dramaturge: where s_he comes from and what drives their interests. I want to develop this approach, as it gives collaborators the opportunity to broaden their horizons, be it through analysis or imagination. To come back to – and conclude with - the group of ten young dancers in Leeds: being confronted to a group was a very exciting challenge for me. I was proud to find out I have acquired a number of tools and ways of engaging with a proposal that can stimulate a two-sided transmission. I felt that I could pass on to them all of what I have experienced during the Performing Gender project: the overwhelming mixture of people, situations, discussions, ways of seeing and ways of doing things. I am happy that so much has stayed with me and that I could open it up for further creative processes.